In stock -This product will ship today if ordered within the next 51 minutes. Natural Health Practice - Hair, Skin and Nail Support promotes health, radiance and beauty. It contains a unique combination of vitamin C, biotin and zinc to maintain beautiful hair, skin and nails from the inside out. This special formula is for those women who want to look after themselves from the inside out by providing nutrients that can help with maintaining healthy hair, skin and nails. It is all about beauty from the inside out and has been formulated especially for health, radiance and beauty. 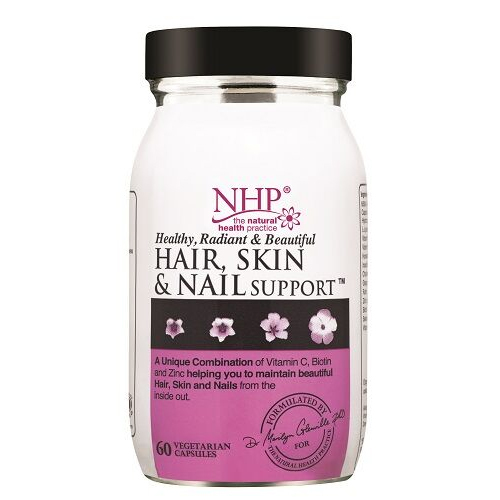 Hair, Skin and Nail Support is a special combination of carefully chosen nutrients for women. It includes zinc which contributes to the maintenance of normal hair, skin and nails, vitamin E which contributes to the protection of cells from oxidative stress and vitamin C, which contributes to normal collagen formation for the normal function of skin. Other nutrients which have been included are antioxidants such as rutin, vitamin E, grapeseed and selenium. It also contains lysine, MSM, inositol choline and vitamin B12 to help you maintain beautiful hair, skin and nails from the inside out. Hair, Skin and Nail Support is free from gluten, yeast and dairy products. It is made without the use of artificial flavours, colours or preservatives and is Kosher and approved by the Vegetarian Society. The Natural Health Practice specialise in supplying only the highest quality nutritional and herbal supplements. Their aim is to offer you good quality supplements where the nutrients are in their most bio-available form so they are easy for your body to digest and absorb. When you take vitamins, minerals and herbs, you are aiming to give your body the tools to help itself and get you back into good health and then maintain your health. Unfortunately, many supplements nowadays contain unnecessary and possibly harmful substances that make your body work harder to try and get rid of them. This is why it is so very important that the vitamins, minerals and herbs you use contain only the highest quality and most natural ingredients possible. Capsule Shell: Hydroxypropyl Methylcellulose, MSM (Methylsulfonylmethane), L-Lysine, Vitamin E (d Alpha tocopherol), Vitamin C (Ascorbic acid), Horsetail herb, Inositol, Choline Bitartrate, Grape seed extract, Rutin, Zinc (Citrate), Biotin, Selenium (Methionine), Vitamin B12 (Hydroxycobalamin). For best results take 1 to 2 capsules daily with food. Below are reviews of Natural Health Practice Hair, Skin and Nail Support by bodykind customers. If you have tried this product we'd love to hear what you think so please leave a review.